I understand that the charter companies have made Brewer's Bay off limits due to cables on the sea floor. If I do take Auspicious to the BVI I'd like to spend some time off the beaten path, and Brewer's certainly falls in that category. Does anyone know if the cables are in fact as routed on the charts, and if there are signs on the shore line to show where they come ashore? I have not seen any signs onshore indicating cables in the last 18 years. 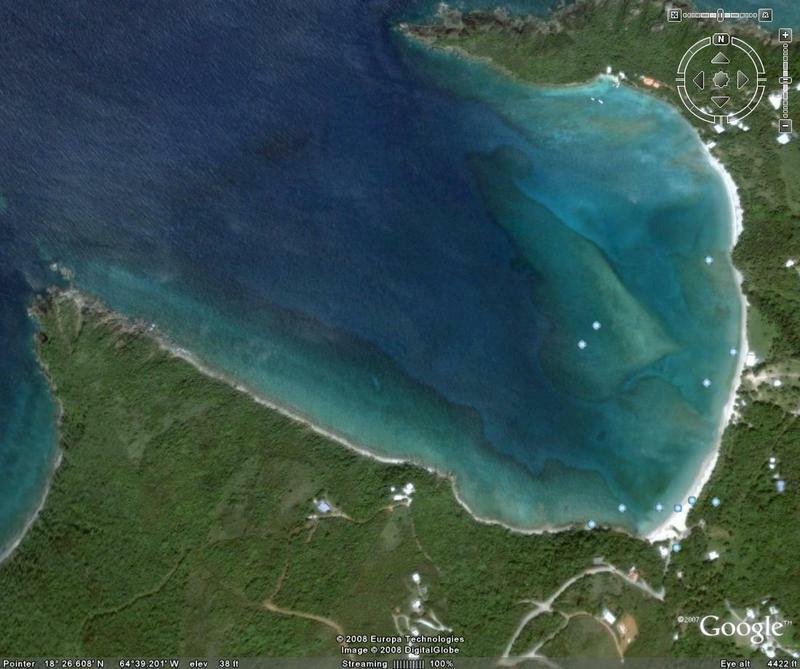 This picture will give you a pretty good idea of what's going on in Brewer's Bay. Most boats anchor on the east/right side as Zingara has done (that's one big cat!). I think if you know what you're doing you can anchor on the west/left side as the smaller cat has done (I think that was a Festiva boat). That is a beautiful photo of Brewers Bay! My interpretation of NOAA 25641 is that the cables run in between the reefs toward the Southern side of Brewers Bay, so the logical place to anchor is in the smaller are to the North. I thought there was a larger scale chart than 25641 with more detail in the Bay, but perhaps I was fantasizing. Anyone actually anchored in there and care to share experience? Any suggestions on getting good data on where the cables really run? We've always anchored on the southern end (pretty much where you see the small cat in DMgators photo). We had a local captain/friend aboard (25 years on ilon) that brought us there. I mentioned the cables, he said no worries. That and 50 cents will get you 1/8 of a cup of coffee at Starbucks. Sandy bottom, good holding and you'll definitely be alone!. Sorry - no definitive answer on the cable.